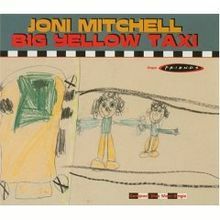 "Big Yellow Taxi" is a song written and originally performed by Joni Mitchell in 1970. It was a big hit in her native Canada (#14) as well as Australia (#6) and the UK (#11). It only reached #67 in the US in 1970, but was later a bigger hit there for her in a live version released in 1975, which peaked at #24. Charting versions have also been recorded by The Neighborhood (who had the original top US 40 hit with the track in 1970, peaking at #29), Maire Brennan, Amy Grant, and Counting Crows. Ladies of the Canyon is Joni Mitchell's third album, released in 1970. Its title refers to Laurel Canyon, Los Angeles, a center of popular music culture in Los Angeles during the sixties. It features several of Mitchell's most noted songs, including "Big Yellow Taxi", "Woodstock" and "The Circle Game". Joni Mitchell, CC (born Roberta Joan Anderson; November 7, 1943) is a Canadian musician, singer songwriter, and painter. Mitchell began singing in small nightclubs in Saskatchewan and Western Canada and then busking in the streets and dives of Toronto. In 1965 she moved to the United States and, touring constantly, began to be recognized when her original songs ("Urge for Going," "Chelsea Morning," "Both Sides, Now," "The Circle Game") were covered by notable folk singers, allowing her to sign with Reprise Records and record her own debut album in 1968. Settling in Southern California, Mitchell and her popular songs like "Big Yellow Taxi" and "Woodstock" helped define an era and a generation. Her more starkly personal 1971 recording Blue has been called one of the best albums ever made. Musically restless, Mitchell switched labels and began moving toward jazz rhythms by way of lush pop textures on 1974's Court and Spark, her best-selling LP, featuring her radio hits "Help Me" and "Free Man in Paris." Stephen Colbert: Oh and, you know, masturbation.